Wow, that is a big list!! I think I lost a total of 3 or 4 plants. Will have to look when I am off on Monday! DND, wow, so sorry you lost so many. I'm in zone 5 and I lost daylilies this year too. VERY unusual for me. It was a bad winter for them. Gee, I didn't realize I lost that many until I listed them here. Needed to get back to this post to say that I was WRONG on three of these. I always tell others to "just wait and see". I waited a long time and finally this summer these did come back. In the list of lost DL's are five Evergreen and four Semi-evergreen. Do I put my guard up again???? Hmmm...maybe, maybe not...we'll see. If they aren't too expensive I guess I will let my guard down again. This winters toll wasn't nearly as bad as I'd feared. Big credit to late fall 6" leaf mulch, which I will continue to do as long as Im able. Only one, and sadly, not the one I'd feared ended up as a "goner." Two were new last year and had me worried, they'd both lost a few fans over the winter, but both Green Ribbons and Spiral Distraction now have at least one scape and have 4 fans showing! Initially each one only showed SF at first. WALTER KENNEDY had been a big clump but only showed a couple of straggling pieces this spring. I dug up the entire clump and gave it to a new club member when she stopped by a couple of weeks ago. She lives about 45 minutes due south, and that will help!! All of the fans, about 10, were budded, so she should be seeing a clump by now. The one that died sadly, had been a new one, ELFIN BLUES, last spring. It had grown to about 4 fans by fall but only one tiny fan came up this spring. That keeled over after one of the weather extremes. SIgh. But only one loss isn't bad, as we had a harsh winter. I had taken the marker for SMILING COBRA into the garage a couple of days ago and was going to dig up what was left , admit defeat, and plant something else there. But wait! A fan JUST emerged this past Friday . SO: note to self, wait until at least June 1 before you write them off!! It may not get back to the small clump it was last year, but it lives to fight another day!!! I'm surprised to hear that 'Lunar Mist'–a toughie from "old-school" northern dormant lines–didn't make it. Any idea what happened? Was it recently planted? Seedling losses are the worst. The one that really got me was back in the 90's; vacation + drought + malfunctioning sprinklers claimed a big flat flashy rose from Frank Gladney x tet. Lake Norman Sunset. Thank you for the concern and the info. I'm not sure what happened to Lunar Mist, but since I never saw it bloom, I suppose that does leave open the improbable-but-possible event of being sent the wrong cultivar. All of my daylilies were potted up and overwintered in empty raised garden beds with a small bit of leaf cover for protection. Lake Norman Sunset is a pretty daylily, I can only imagine the beauty you must have had out of that. (I'll have to look up Frank Gladney, though.) Sorry for your seedling loss. Heidi, I'm surprised Hanalei Bay croaked on you. Mine is still alive but it hasn't increased. Mind you, it looks a bit ratty but unlike other Maryott gift plants I got it didn't lose fans. bxncbx said: Heidi, I'm surprised Hanalei Bay croaked on you. Mine is still alive but it hasn't increased. Mind you, it looks a bit ratty but unlike other Maryott gift plants I got it didn't lose fans. And then there is Billy the Kid....lots of new fans, same for Coralitos Rose, Happy Silver Anniversary and Laguna Seca. PRickly Sensation is also a good performer here. What I am finding is that my dormants and evergreens seem happiest. It is mye semi's that seem to struggle more. Heidi, only Prickly Sensation is doing well for me. I previously had it as a single fan (sent by accident) and it didn't survive the first winter. I got a clump this time and it seems very happy. I've had Fiji for years and it is very slowly adding fans but hasn't bloomed in years. At least Exotic Design throws up a scape now and then. DND, so sorry about your winter losses, that is a lot, and several really nice ones. I think I lost a couple, and they were wispy, struggling plants. Not positive though because I moved several struggling plants last fall and sometimes the tags don't make the trip with them. I rarely lose plants in the winter, my problem shows up in August or so, with crown rot. @alilyfan - thank you. I'm sorry to hear that crown rot affects your garden. It's hard losing daylilies. The really sad thing is that my list above was only the losses in the first half of my garden. I never came back to post the other half, which is at least as extensive. The sad part is that a LOT of my losses were just purchased on the LA Auction last year and I've barely had a chance to enjoy them, if I did at all. Sorry about your losses DND. 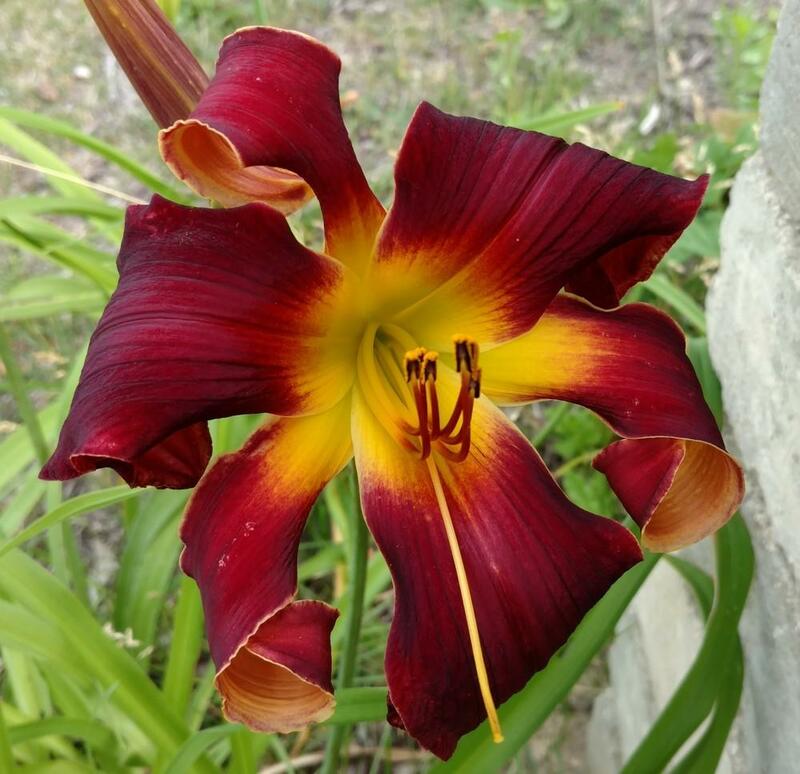 I get years like that when I lose quite a few daylilies. This year I've only lost Tropical Cooler and Lizzie's Legacy for sure. I'm waiting on several others to show themselves but I have no faith that they will. Most were struggling or new so no real surprises there. I'm more upset about losing seedlings now than named cultivars. I lost 8 seedlings this past winter/spring. Doesn't sound like much but I don't grow out many seedlings (typically 20-30/year) so it's a significant number. Most should have bloomed this year and I was really looking forward to seeing what they looked like. The only positive is that I'm now figuring out which parents have really good genes for my area. Gold Helmet produces very few seeds either as a pod or pollen parent. But all three seedlings from a cross with South Seas are still alive. They definitely take their plant habit from GH. My Butterscotch Ruffles crosses died but BR can have issues in the spring. Fiji is also a good parent for me so I'm hoping it will bloom this year so I can make more crosses. I have a bunch of Tropical Cooler and Lizzie's Legacy seedlings that I started this year. Time will tell how many survive until blooming! Oh, oh my, that is REALLY a lot of losses. I would be totally devastated, so very sorry! Heck, that is a lot that you have lost, I know that I complain about all our rain but I do realize that I am very lucky to live in such a temperate climate despite being so far north. DND - So sad to hear of so many losses. I lost quite a few last year during Hurricane Irma. I haven't had the heart to go do a real check yet of just how many and which ones. I do know I lost Zoe Allegra, Marilyn Morss Johnson, and Paper Butterfly which have the nice eyes and blooms shape. I don't have many cultivars that I consider "fancy face", so that was a big loss for me. I hope you're able to rebuild your fancy face collection. And I hope mine stop dying, too. Lots of wasted money.